The Sinkhuis is a new residence for an architect and his family, situated just outside the historic core of Stellenbosch.The site itself is on the cusp of a low hill, between the Jan Marais Nature Reserve and the Eerste River Valley. There is also an historical leivoor running from east to west across the southern slope of the site. Entry to the property is from the southern edge. Spectacular views to the north and east, towards the mountains surrounding Stellenbosch, dominate the site. The dream was to create a plaasdorpshuis, in a similar spirit to the many simple and direct structures of its kind to be found on farms all over the country. This led the design in the direction of four shed-like structures, clad in corrugated iron. These are placed on a base of carefully constructed stone walls. The shed-like structures form discrete elements, creating the memorable profile of the building against the larger landscape. The stone base forms the connecting element between the 'sheds'. The simplicity of the recognisable profile of the house belies the complexity of the geometry within the sheds. Just looking at the plans of the building, one wonders at the reason for this complexity. However, experiencing it in reality explains the natural logic thereof. The geometry brings a dynamic quality to the way that the static shed-like structures are experienced. By means of this manipulation, a logical route is created through the building that combines many sensory experiences such as light and darkness, focused views and generous open spaces. This route starts from the entry, uniting all levels while it culminates on the roof terraces. The views from these terraces stretch towards the north and east, but maybe the most surprising one is from the terrace on top of the architect's art studio. Here, the view towards the south is celebrated. The three-dimensional tour de force created by this elaborate route evokes memories of the 'house as village'. In many North African and Eastern Mediterranean villages, formed by organic action and reaction, one would find a similar complexity. It is within this dynamism, versus the static forms mentioned above, that the masterful hand of the talented architect is to be experienced at its best. The house affords generous openings to the gardens on the north and south sides. The respective characteristics of these garden spaces are in wonderful opposition to each other. The northern garden is 'wild' and indigenous, linking itself visually and in spirit to the nature reserve just beyond. The southern garden is a traditional kombuistuin. This garden is quite formal in its design structure. 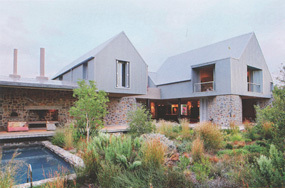 It is, however, romantically overgrown in its abundance delivering vegetables to the relaxed and spacious plaaskombuis. This is an expertly crafted and carefully designed building. It is largely motivated by the desire for a rural lifestyle and its symbolic forms, while the site is actually located on the suburban outskirts of Stellenbosch. Like all good and provocative architecture, there are also contradictions embodied in the building. However, the contradictions are masterfully and poetically handled by this talented architect.